ok there are many different diets out there ie Atkin's etc. work for seditary people and thats why there are diets like Atkin's. It's not that it doesn't work- eating the recommended food pyramid does work, but you have to maintain an active lifestyle. Most folks that live here in the USA do not, which is why we have the high incidences of obesity than other countries. It is so much more apparent if you go to other countries and look at their lifestyles and eating habits- they are so much more active than we are, they have smaller portions of food, and they don't have a lot of the processed foods, meats that are tainted with hormone treatments, artificial flavorings, etc. I truly think that in order for us to get off the obesity train, we need to re-educate people to take the time out to incorporate exercise, as well as incorporate exercise into our daily activites, and eat more responsibly. Unfortunately, in our country, we are all about the quick fix and the easy way out- that's why the diet industry is a multi-billion dollar industry. It will remain so until people realize that if all these quick fixes truly worked, we'd all be skinny by now! The idea of these diets are not to cure the problem, but to keep us from achieving our goals but continues to make the promise that someone out there has done it using their products, which makes people keep on heading on out to the stores to get the next miracle diet. I was thinking about this very thing the other day. Remember the 80s? It was all about counting calories. Remember the 90s? It was all about counting fat. Now in 2000, it's all about counting carbohydrates. What's next? When all that fails, it'll all be about counting fiber? I will bet you guys anything- in 10 years, there will be a new diet that has nothing to do with counting fats, carbs, or calories that promises to be the miracle cure- and in the process, it will probably make us even fatter than we already are, as people will become lazier and lazier and skip the exercise in the quest for the perfect body. Basically, there are, but no one is going to make any money out of that. They need a catchy name and slogan to market. For example, the Zone diet is pretty much eating a healthy balanced diet, the only thing is it focuses on reducing insulin surges. Also, people have a skewed view of what is healthy and balanced due to marketing over the years. When I ask people; "Do you eat a healthy balanced diet? ", the answer is invariably yes. Funny thing is, the people that I ask this question of are invariably over-weight. As an aside, my competition diet is isocaloric which means equal calories spread between carbs, fat and protein. Some people hard on vision can't read nutrition panels. Others can't understand them. Then they buy products based on low-fat, no added sugar and the like... Usually they are the worst products! Some people who "eat balanced" or "healthy" often choose fish or chicken over beef. Sounds like a good decision but then they go ahead and have it fried with a butter sauce. Mon dieu! Others who are trying to lose weight skip breakfast, have a cracker and a salad for lunch. That can't be enough for anyone then they binge on nuts, chocalate biscuits or anything else lying around the house while watching TV. Some people "don't do" vegetables... Their idea of vegetables is that three week old cauliflower in the back of the fridge or that frozen corn that is used to prevent bruising and swelling after injury! Lack of education in basic food nutrition, understanding choices and that fresh fruit, vegetables, legumes taste really good and are quick, easy to cook and prepare. You don't need brains you just need a credit card then you'll be happy, healthy, driving a <insert luxury car brand>, have lots of friends and finally get that honorary doctorate you always deserved. I think there is some truth to the idea carbs in particularly complex carbs need to be adjusted to the activity level.I know when I cycle long distances my complex carb level and percentage of diet go way up while the lower my activity level the lower the carb ratio.Luckly with my metabolism level I can't stay sedentary for very long.Basically you can only store so many without them turning to fat so really more the way I look at it is I always try to keep my carb stores topped up no more no less.I do agree however over the long term and on average my diet is probably fairly evenly split between protein,carbs and fats . I agree completely, it's called temporal nutrition, you eat for your activity level. Using food as a tool to give the body energy and to repair itself. Problem is, food is seen as a luxury and pleasure in our community. I see my everyday diet as a training tool. Sure, I go out and have a nice dinner, but that's not considered normal for me. Therefore, it is classed outside of daily nutrition. I was telling another personal trainer the exact same thing! Dr. Phil is as full of it as his stomach- and he claims to be in shape. I saw him on Letterman a few weeks ago, and in the attempt to prove how fit he was, he took off his jacket and stood up and rolled up his sleeves (the "now it's time to get to work" kind of rolling up his sleeves). All I saw was a big 'ole gut hanging over his belt and a cinched belt in the attempt to hold it all in. What a candidate for heart attacks! Dr. Phil excuses fat people by saying it's all about people being emotionally dysfunctional. Bullcrap. It's about people being lazy, eating too much, and always taking the easy way out to lose the weight. :-/ We all know the easy way out doesn't work. If it did, wouldn't it be easy to lose weight? Counting carbs is good to do if you're not eating the correct type of foods- if you know that it's better to eat foods that are unprocessed and are complex carbs, you won't have to worry about counting carbs. That's the reality of the situation, but people tend to think a carb is a carb is a carb. That's not so- and until they realize the difference, diets like Atkins will rule the day. Add that to RTWD's assertion that he needs more complex carbs when exercising. Also true, but consider that the majority of the population doesn't even do one fifth of what RTWD does for fitness, and his carbohydrate requirements do not even compare to the rest of the population. We need to start looking at people as the individual and address their lifestyles one on one and assess what they need for their nutrition and fitness. Doing that, and assuming that the person will take our suggestions and make that lifestyle change necessary to increasing their fitness levels, we probably can eliminate diets. I think it's great to see food as a training tool, but it's definitely more important to know that what Croak said in the first part of the statement is more applicable to the general population- food is seen as a luxury and not as a necessity. We need to see food as a way to satisfy hunger and to stop eating when we have eaten enough to satisfy our hunger. Too often, we eat until all the food is off the plate, we supersize and eat every bit, and we eat when we're not hungry. We really need to re-teach ourselves how to eat properly and to recognize the cues from our bodies for when we're hungry and when we're not. If we eat for our activity level, I get the feeling that some people wouldn't be allowed to eat! Still, that's very true. But instead of saying that, we should be focussing on increasing their activity level so they could eat without gaining the extra fat. Food is one part of the problem, and activity level is the other part. We can't look at one problem without addressing the other. It is interesting how overweight people are becoming more and more common. Plus we are getting more and more of what I suppose one might call the "hyperobese", that is people over 300 lbs. People of that weight were just about unknown 40 years ago and now it is pretty common. One gains weight by either eating too many calories or by not burning enough calories or both. The thing is that our society has pushed both sides of the equation to help weight gain. It is nearly impossible to get a decent meal at most fast food places and the "typical" meal is incredibly loaded with fat and calories. The other thing is very few people get any exercise at work. That is most people have a sedentary job. Now, I took a 2 week bike tour out west a few of years back. I averaged something like 75 miles per day and nearly 5,000' of climbing, plus sight seeing and setting up my tent and all. So it was pretty active. Now I ate only what was provided and I avoided fats and favored complex carbs and vegetables. Still, my caloric intake was probably over 3,000 calories per day. I lost 10 lbs in the 2 weeks by increasing the burn side of the equation. I was figuring on losing some weight but I had no idea I was going to lose that much that fast. What I found amazing is that some people GAINED weight on the tour! They would go into town and eat a "second" lunch which consisted of the largest cheeseburger they could find with a mountain of fries, a soft drink and a great big sundae of some sort. It is not that hard to lose weight, if you do aerobic exercise daily and cut the "empty" calories out of your diet, reduce the fat and eat more vegetables instead. But as someone pointed out, how do you make money selling that diet? Also, some people's schedules do not allow it. I have a friend who bicycles and is a diabetic. His job in software design often requires overtime and that means he can not get in the daily aerobic exercise that he really should have. Yes, but a gluten free diet can work wonders, whereas many try to eat more, instead of less wheat. Gluten is contained in rye, wheat, spelt, triticale, and other ingredients. It has been afiliated with many stages and forms of disease, not the least of which is weight gain. The food pyramid is a load of commercial driven media prattly from the 80's. It should not be taught in schools today, period. Another really interesting thing I do with clients is ask them to estimate calories and weights of particular meals they have. So the bring in this monster sandwich and say, "Oh I think that is about 500kcals of food there...", when it is bordering on 3000kcals. Fat people always underestimate the size of their meals to help rationalize it in their own minds. It's amazing, they will argue with me until I break out the scales! Fat people always underestimate what they're eating. Sometimes they lie to- not on purpose. They figure that handful of potato chips they had here and there don't really count, so they don't add it in when counting their calories. I think people are also stuck on that calories in= calories out too. From all the diet and exercise alone, I think that old myth is exactly what I stated it is- a myth. People all have individual metabolisms. Some people have faster metabolisms than others. I think my metabolism is VERY slow. How could I log in over 5000 miles for the year, eaten sensible meals, yet still not have lost much weight. Then I look at some of my students in class. They take 5 classes a week, eat sensible meals, maybe lift weights twice a week and they've seen more results than me. Males can more easily lose fat than women due to their higher levels of testosterone and their tendancy to gain more muscle easily. We all know that muscle burns a fair amount of fat, and the more you have of it, the better you are at burning calories. There are so many variables involved with fat loss, and we just cannot oversimplify what it takes to burn fat. I don't think the food pyramid was some kind of gimmick. Before the pyramid, when people started gaining weight and those obese people started popping up all over the country at an alarming rate, we needed SOMETHING to guide us with how to eat. The problem I see with the food pyramid is that it doesn't take into account activity level, and it doesn't go into complex vs. simple carbs or nutrtional content in general. Something is better than nothing, and the food pyramid is just a guide to help give people an idea of what they should be eating. The problem is, the food pyramid fails on a few counts, some that I mentioned above. I think part of our problem lie from the diets that are developed that seem to conform with the food guide but give us way more fat than we are aware of, and the advent of "low fat", "reduced fat" and "fat free" foods. Foods may be fat free but contain a lot of simple carbs and sugars, and as people are lulled into a false sense of complacency that these types of food will not make them fat, they eat more, not knowing how many more carbs are added to the diet, making them even fatter. All these fat people fell for it, and I think that's a big reason why we are seeing an implosion of people over 300 pounds, including kids. How can the food pyramid fight this when the food and diet industry creates food that get around the food pyramid and allow people to think that the product they provide conforms to the food guide when it doesn't??!! Better to have something than nothing. I don't blame the food pyramid as much as it needs a serious update. This is something they're attempting to do now, but at the end of the day, we all need to get a lot smarter and make better food choices, as well as increase our levels of physical activity. And that is a problem with losing weight. Everyone is different. When most people diet, their bodies think that they are being starved so they scale down the metabolic rate to a very low level. The result is that with many people, dieting will get them nowhere because of this adjustment on the burn side. Scientific American had an article years back about people who were starved (no food) for months and I think their average burn was about 500 cal per day. That is a week to burn a lb of fat! This is why cutting out egregious things from your diet and exercising does work. A regular exercise routine will largely prevent one's body from scaling back its metabolic rate. Not only is there a genetic component but there are others as well. There are families where affection is shown by feeding people and most of us will see this in action at Thanksgiving. There are people who reward themselves with special treats. There are people who "pick" themselves up by taking in a special snack at certain times of the day. It is just very easy to sabotoge yourself. As Koffee says, it is extremely easy to underestimate portion size on things like potato chips. I find it easier to not even try. I just avoid certain foods nearly all the time. I have the ability not to eat potato chips when they are not at home. I doubt I have the will power to eat 7 potato chips and stop. And even if I do, it seems like too much work. Also there are just so many food sources that are extremely yummy, convenient to eat and readily available. It is no surprise people are so obese. It would be different if to eat lunch, you had to walk 2 miles and then everything on the menu was green leafy vegetables, fruits and whole grain things (and then you had to walk 2 miles to get back). It is just very convenient to eat poorly and it takes care, attention and knowledge to eat in a proper fashion. In a time constrained society, it is no wonder that people are getting fat. If it is "not that hard" to lose weight, why is it that some people will do everything right and still not lose weight? If it is "not that hard", why is it that so many people pay billions of dollars to do all the diets out there, join clubs and attend classes and hire personal trainers and still not lose weight? If it is "not that hard" to lose weight, why do we have a nation of fat people, with so many people at the morbidly obese level? What may work for you may not work for others. I shudder at personal trainers, dietitians, etc. that lump every person into one category because what worked for them does not necessarily work for someone else. Part of the reason why people are so obese is due to the fact that we lump them into one category and give them the same diagnosis. We need to address the individual and see what's going on with their metabolism, their food intake, their physical activity level, their strength training program, and other factors about their lifestyle. Every personal training program emphasizes training the individual after assessment and not giving one exercise program to every person you train. I've done a few short tours and I've done longer tours too and I've never lost 10 pounds on a tour. However, I've seen an overall decrease in my bodysize in general. I ate well, knowing I needed those complex carbs to get through the day and cycled all day carrying my own gear, not doing some group tour where they carried all my stuff. While I was in Italy, I met this guy who climbed up and down the mountains in Switzerland, then rode through Italy, then hit Greece. He had incredible musculature, but he also had a gut. From what he was saying, that gut never went anywhere. Still, he wasn't obsessing about it. In fact, he seemed kind of proud of it. Ha. He was pretty funny and good fun to talk to. If we were walking down the street, people would have said he was overweight, but at the same time, he's fitter than most people, and anyone going up one of those mountains in Switzerland would have been hard pressed to keep up with the guy. Something that would have taken 5 days for a normal person to climb would take this guy a day and a half. He was one of the most impressive cyclists I've ever met, but at the same time, he had that gut... whew, it was pretty big. Another part of our problem is our oversimplification of how easy things are if we just reduce our caloric intake and increase our physical activity. There's a LOT more going on than that, and by oversimplifying the problem, we actually contribute to the problem, not help. "amount in" is perhaps the simplest thing to change. "amount out" is a much more complicated function of body needs, excercise levels, and metabolic rates. because of organismic homeostasis and that last contributor, "amount out" is also a function of "amount in," which greatly complicates the system and is the reason most diets don't work. the interdependence produces a hysteretic effect whereby there is an optimal number of calories for each person to eat, an amount which depends on the other variables contributing to "amount out." this amount is exceedingly difficult to calculate. for this reason, the simplest thing to change is not at all the *easiest* thing to change. the easiest thing to change is exercise level, because it is decoupled from the rest of the equation. that is, it doesn't directly affect "amount in." I don't think losing weight is as hard as you're making out. In my experience, most people want to do the right thing but are either too lazy or making some grave mistakes (unbeknown). The lazy group will make excuses until the cows come home why they are still fat, nothing will ever change that. The other group just needs a bit of information and they are set. Calories in versus calories out doesn't work. It's a good model, but as all models, is simplified way beyond anything remotely helpful. I don't feel like I'm lazy, but in the time that I've logged in over 5000 miles since Jan 1, 2003 and kept to a strict diet, I've lost about 10 pounds. I'm POSITIVE there are others who have done the same and they've seen better results than me. I have seen a small improvement in my size- I've gotten slightly smaller, but I've seen people do less and get better results. It has to do with a lot of stuff- my GENETICS, my METABOLISM, being FEMALE, my BODY TYPE, and the amount of exercise I do. I know others who seem to be predispositioned to certain body types struggle with similar weight problems. I don't call myself lazy, but it seems like you seem to call me lazy, Croak. What's up with that? Part of my problem with personal trainers and people in the fitness industry is that the vast majority of them never struggled with weight issues, never had weight problems like the rest of the general population, and never had to work out as excessively as others, and then they feel like because they crack books and spout the statistics, they are suddenly experts in the field. One thing I'm thankful about is that people have seen me struggle with weight over the years and as my weight comes down, they know that what I say really can work for them (with modifications based on their goals, body type, and the amount of time they have available) if they would just commit to a lifelong lifestyle change. One of my clubs got bought by another club, and a lot of the members left, and some of the members saw my picture on the wall of my current gym and were astounded at how different (healthier and leaner) I looked and joined on the spot. One particular day, I was at the club and the membership office brought some new people in and told them all about the weight changes I've made over the years. I think it really helped to inspire them. I certainly do think personal trainers have their place, and I don't knock the people who are already personal trainers, but if I hear someone in the fitness industry saying it's not all that hard to lose weight, either they 1) have no idea of how hard it is to lose weight because they've never been overweight (as in 20 pounds or more overweight), or 2) they have the theory memorized but truly don't know how to deal with people on a case-by-case basis. Look around at every health club, and you'll see individuals- people are all doing different things to achieve the same results. What works for one may not work for another. Two people may have the same weightlifting program but see totally different results. If it were really that simple, and all people needed was a little know how, they would have already lost the weight! Yet we still have a nation of obese people. So then they say that those people must be lazy. Well, maybe they're not lazy- maybe the people who've given them the information are just spitting out what's told- they know the theory, but they don't know the practice. As I said before, if losing weight was that easy, even SLIGHTLY easy, we'd have less problems with obesity. The fact that we have such a problem despite all the diet fads out there should be an indicator that there's more going on than even our books can give us, and the sooner we come to this realization, the more help we'll be able to be for our clients. I think a lot of it has to do with effort and perceived effort. There is no way to compare your time and effort with another, and then compare body composition. It just doesn't work. I truly think all the diet fads, marketing hype etc. are all driven by the fact obese people just don't want to put in the hard work. When I say losing weight is easy, the formula to get there is. Rearranging your lifestyle, fighting off urges and sweating are not. They take hard work and most of all, dedication. I do plenty of perceived exertion. Don't forget, I've been tested for %VO2 max, max heart rate, anaerobic threshold, and at what heart rate I burn calories as fat vs. as carbohydrate. In addition, I eat well, avoid the simple carbs, eat smaller meals over the day, I don't eat past 9pm, I teach 10 aerobics classes a week, lift twice a week, and do as much cycling as possible. I don't believe in fad diets anymore, having tried about all of them in the past 7 years, before making the lifestyle change to what I'm doing right now. I also have a dietitian that I see to ensure that I am eating correctly since I do so much exercise. You cannot be as serious as to judge me and assume that it's my LIFESTYLE that's holding me back? You cannot be serious enough to assume that I have not put in the effort? You don't call that hard work already? What do you consider to be perceived effort, and effort if what I described to you is not? The fact that I've kept up with an exhausting training program that I work on progressing year after year is not dedication? After describing my efforts (or lack thereof, as you seem to think), you really think that weight loss is still some old-school formula? I think it's time for you to get to another convention. ECA is pretty good, and they've got good seminars. Try Sally Edwards Heart Zones convention too. It's all seminar and worth the time and effort. Luckily, a lot of the people there are WAY beyond formulas and the old "just put your best foot forward and it'll happen easily enough" approach. One dimensional thinking is the number one problem I see with personal trainers- that kind of thinking is very strongly discouraged when you go for any certification these days. I think it's time you start thinking out of the box. Or maybe it could be too much dependence on book learning without much personal experience behind what you're saying? Say it ain't so... tell me I misinterpreted what you were trying to say about my training program! As an aside- I have a book I picked up at my Heartzones convention in Seattle that goes into a lot of detail about the very claims you make that breaks it all down chapter by chapter. For Christmas, I'd like to send you this book... if you're interested, drop me a PM and I'll get your info and send it right over. Hopefully, after reading this book, you may modify how you deal with and train your clients and you'll have a better understanding of what people who are not lazy, doing the best they can, and have plenty of information but still struggle with weight issues are going through. I know I'm glad I got the book, and every person that got the book so far has said the same. Losing weight is NOT easy. This formula varies for each individual. I am no personal trainer, but I feel that I am armed with a lot of good informaion and good sense about what is good and what is not. Folks need to realize that things like LIFE, everyday living can easily derail any well meaning effort. It takes lots and lots of self control to say on any sort of prescribed (self or otherwise) lifestyle change . Stress is a big culprit to sideling good eating habits. The best intended day can go South on the turn of a dime. People often turn to food to make them feel better at these weak moments. This is not an easy moment, nor I am sure do people feel good about themselves afterwise. Eating like this is a sort of addiction I think, and those addicted are turning to food as the "tool" to help themselves feel better instead of turning to more philosophical means. I am sure that this is not "easy", but keep trudging ahead thinking that "tomorrow I will do better". Losing weight is NOT easy. This formula varies for each individual. I've been overweight most of my life. I've tried every diet that has come along. In the past the only ones that have worked for me were the liquid protein (milkshake) diets or "starvation" diets. I don't recommend either one. Recently I found a book that explains it all in simple language that makes a lot of sense. It's not a diet in the usual sense of the word. It's an eating plan, defining which foods are good for you (beneficial to health AND weight loss) and which ones aren't. I've been trying all summer to drop 10 pounds (as a start) and haven't been able to do it. I was riding 20 miles a day at the beginning of the summer and increased it to 35-40 a day by mid October. Now, riding combined with this new way of eating I've done it and hope to lose more, even during the upcoming holidays <crosses fingers> . 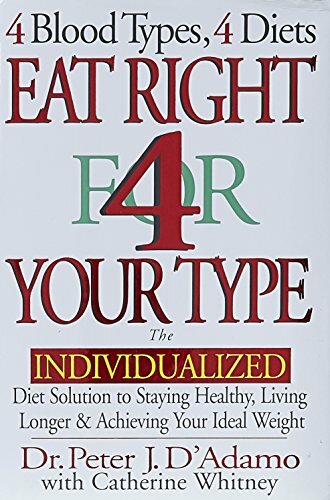 There are a few other companion books that discuss recipes, lifestyle modifications, illness, etc. I highly recommend it. Ron, I hate to say this, but every dietitian's seminar I've been to has said this is yet another gimmick touted as "dieting". One's blood type has little or nothing to do with weight loss. Now, if it was about about the basic body types and how to exercise based on your body type, I would say it would be a better book. The grapefruit diet is about as good as this diet, although I am glad it talks about sensible eating. Well, this is the first diet my wife and I have tried where we both *feel good* and are losing weight while dieting, even though we aren't dieting in the usual sense of the word. We aren't hungry between meals. And my wife's IBS problems haven't troubled her since we started following this eating plan.